Self is on the throne, directing decisions and actions (represented by the dots), often resulting in frustration. Jesus is outside the life. “A natural man does not accept the things of the Spirit of God; for they are foolishness to him, and he cannot understand them, because they are spiritually appraised” (1 Corinthians 2:14). Jesus is in the life and on the throne. Self is yielding to Jesus. The person sees Jesus' influence and direction in their life. “He who is spiritual appraises all things...We have the mind of Christ” (1 Corinthians 2:15). Jesus is in the life but not on the throne. Self is on the throne, directing decisions and actions (represented by the dots), often resulting in frustration. God has promised and provided for us an abundant and fruitful Christian life. He is either uninformed about, or has forgotten, God's love, forgiveness, and power (Romans 5:8-10; Hebrews 10:1-25; 1 John 1; 2:1-3; 2 Peter 1:9; Acts 1:8). He cannot understand himself - he wants to do what is right, but cannot. He fails to draw upon the power of the Holy Spirit to live the Christian life. (The individual who professes to be a Christian but who continues to practice sin should realize that he may not be a Christian at all, according to 1 John 2:3; 3:6, 9; Ephesians 5:5). Jesus promised the abundant and fruitful life as the result of being filled (directed and empowered) by the Holy Spirit. 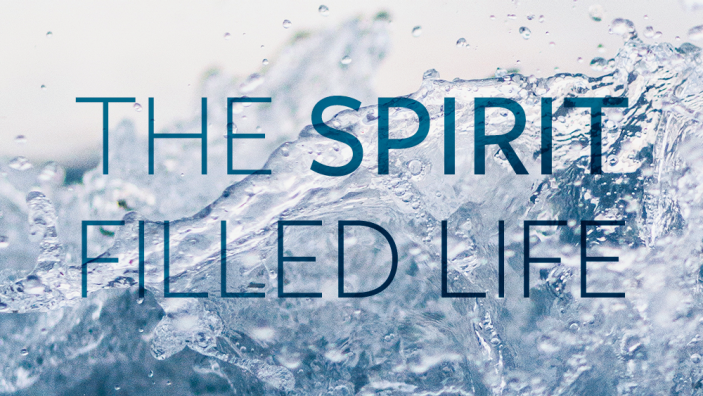 The Spirit-filled life is the Christ-directed life by which Christ lives His life in and through us in the power of the Holy Spirit (John 15). We are filled by the Holy Spirit by faith; then we can experience the abundant and fruitful life which Christ promised to each Christian. Present every area of your life to God (Romans 12:1, 2). His Command: Be filled with the Spirit. “And do not get drunk with wine, for that is dissipation, but be filled with the Spirit” (Ephesians 5:18). His Promise: He will always answer when we pray according to His will. “And this is the confidence which we have before Him, that, if we ask anything according to His will, He hears us. And if we know that He hears us in whatever we ask, we know that we have the requests which we have asked of Him” (1 John 5:14, 15). Does this prayer express the desire of your heart? If so, ask God to fill you with the Holy Spirit right now and trust Him to do so. How to know that you are filled (directed and empowered) with the Holy Spirit. Do not depend upon feelings. The promise of God's Word, not our feelings, is our authority. The Christian lives by faith (trust) in the trustworthiness of God Himself and His Word. This train diagram illustrates the relationship between fact (God and His Word), faith (our trust in God and His Word), and feeling (the result of our faith and obedience) (John 14:21). The train will run with or without the caboose. However, it would be futile to attempt to pull the train by the caboose. In the same way, we, as Christians, do not depend upon feelings or emotions, but we place our faith (trust) in the trustworthiness of God and the promises of His Word. Your life will demonstrate more and more of the fruit of the Spirit (Galatians 5:22, 23) and will be more and more conformed to the image of Christ (Romans 12:2; 2 Corinthians 3:18). Your prayer life and study of God's Word will become more meaningful. You will experience His power in witnessing (Acts 1:8). You will be prepared for spiritual conflict against the world (1 John 2:15-17); against the flesh (Galatians 5:16-17); and against Satan (1 Peter 5:7-9; Ephesians 6:10-13). You will experience His power to resist temptation and sin (1 Corinthians 10:13; Philippians 4:13; Ephesians 1:19-23; 2 Timothy 1:7; Romans 6:1-16). By faith you can continue to experience God's love and forgiveness. If you become aware of an area of your life (an attitude or an action) that is displeasing to the Lord, even though you are walking with Him and sincerely desiring to serve Him, simply thank God that He has forgiven your sins – past, present and future – on the basis of Christ's death on the cross. Claim His love and forgiveness by faith and continue to have fellowship with Him. If you retake the throne of your life through sin – a definite act of disobedience – breathe spiritually. Spiritual breathing (exhaling the impure and inhaling the pure) is an exercise in faith that enables you to continue to experience God's love and forgiveness. Exhale – confess your sin – agree with God concerning your sin and thank Him for His forgiveness of it, according to 1 John 1:9 and Hebrews 10:1-25. Confession involves repentance - a change in attitude and action. Inhale – surrender the control of your life to Christ, and appropriate (receive) the fullness of the Holy Spirit by faith. Trust that He now directs and empowers you; according to the command of Ephesians 5:18, and the promise of 1 John 5:14, 15. Adapted from Have You Made the Wonderful Discovery of the Spirit-Filled Life? by Dr. Bill Bright, co-founder of Campus Crusade for Christ. © Cru. All rights reserved.